Residential Small Lot will allow little stacked flats like this. How you use them is up to you! Aging in (a New) Place: A flat with a big front porch, and two revenue streams! If you are thinking about downsizing but don’t want to relocate to a new neighborhood, or to a tiny impersonal apartment in a big boxy building, there are very few choices out there. Luckily, with Seattle’s Residential Small Lot Zoning (RSL), there are some fresh options. CAST architecture has been working with the land use code for about a year, and now that it is approved in many Seattle Urban Villages and Hubs like Crown Hill, West Seattle, Morgan Junction, and Roosevelt, we want to show off some of the possibilities to do density right! We often lament that there are essentially very few single level living situations that aren’t little condos, and even fewer that have been built this century. With this ‘Double Up’ Duplex, there are two primary residences, one at ground level, one up. Each primary residence can be configured with an Accessory Dwelling unit. At 2200 square feet per level Including the ADU), that could be a generous home with a built in rental stream. If someone wanted to develop the whole building, it would be perfectly legal to own the entire building, rent one level, and the ADU adjacent. Don’t want to be a landlord? It can be configured as a condo association. Downsized, accessible, modern, super energy efficient living, with two revenue streams, not to mention a great front porch and big backyard! On any RSL lot, we can design a two unit flat with accessory dwellings units. We’re excited about what is possible under Residential Small Lot and hope that the best solutions get adopted far and wide! RSL Walk ups and cottage developments create a neighborhood within a neighborhood. Seattle is about to roll out a brand new zoning designation, Residential Small Lot. Is it filling a gap, or creating one? Seattle is facing a housing shortage, a climate crisis, and an increasingly inequitable city. Allowing more dwelling options, at various sizes and price points, is a great strategy to combat all three. 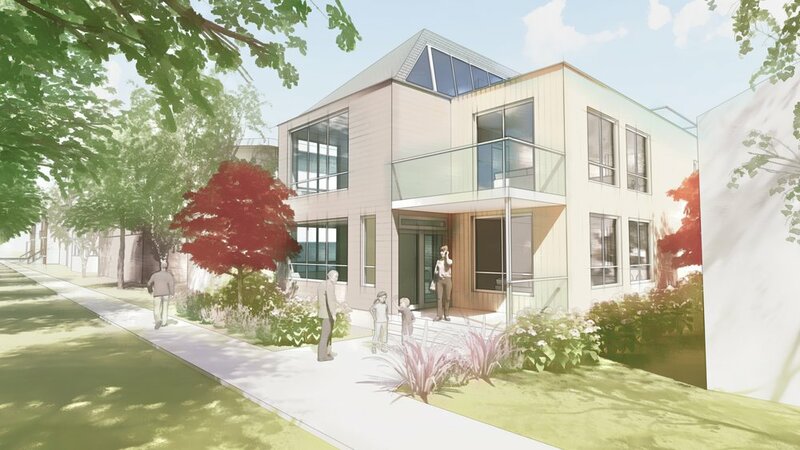 Enter the Residential Small Lot Zone, Seattle’s attempt to add less expensive dwellings in dense, amenity rich urban centers without disrupting the historical fabric of single family detached houses. As part of Mandatory Housing Affordability (MHA), Seattle is rezoning many of the Urban Village parcels currently zoned ‘Single Family’ to ‘Residential Small Lot‘ (RSL). RSL exists under the code right now, but is applied to only 7 acres of zoned land in Seattle and has narrowly defined housing types and restrictions that have kept it from wider acceptance. Under MHA, RSL will be expanded to 768 acres and include about 6200 Single Family Lots. The proposed code has been rewritten from the ground up, so let’s dig in and see what it is likely to produce for Seattle’s neighborhoods. Reading the definition of RSL, it is hard not to feel sorry for this hard working zone. It has to be a little of everything to everyone. It is uncommon for a zone description to get into issues of affordability, children, and the desires of its residents. We don't expect the description of General Industrial 2 (IG2) to make judgments about dockworkers’ life choices. Or Downtown Office Core-1 (DOC-1) to wonder about whether people in Downtown Office Core 2 (DOC-2 ) feel development there is appropriate. RSL. Not elegant, but adapted to its environment. The Nitty Gritty: What does it look like on paper? What does RSL look like? Before RSL zone, this Single family zoned street has 28 dwellings. 57 dwellings on the street, double the current density, but not much change at street level. We've taken the liberty to suggest some prototypes, based on traditional 'missing middle' multifamily, optimized for this zoning. For lots greater than 11,699 sq.ft, this bungalow court has (6) 3BR 1466 sq.ft. primary units, and (6) 733 sq.ft. 1 or 2BR ADUs. This walk up is really a module that can be arranged into twos, threes, any grouping based on density limitations. Our idea is for a stacked duplex, 1500 sq.ft. configured for an ADU, optimized for the allowable FAR on a minimum 4000 sq.ft. lot. We'd target Passivhaus green building standard, integrate green roof, pv, and rainwater catchment. Alternative configurations for ADUs, or future co-housing options. 1.Exempt RSL from MHA fees. New dwellings created in the RSL zone will be subject to MHA, but will anyone built a rent restricted house? No. Therefore, fees due at permit issuance could be as high as $45,650. It will have a dampening effect on any homeowner looking to build a second house on the back of their lot. Many of those homeowners will build an ADU instead (not subject to MHA fee), eliminating the upside of more smaller homes in the marketplace. 2. Allow ADUs to function as MHA performance! MHA performance is 50% for lots under 5699 sq. ft.. Meanwhile ADUs are by definition limited to a smaller size, and making them affordable would be closer in spirit to the original intent of the ordinance. 3. Eliminate new Maximum Net Unit Area limit. Maximum Net Unit Area is a new, unique limitation that only applies to this zone, and nowhere else. It is Floor Area per Unit, and it is often in conflict with the Floor Area Ratio (FAR) for the parcel. There are no MNUA exceptions for existing houses or additions, meaning many of Seattle’s classic bungalows in RSL zones will suddenly become non-conforming, unable to do a ‘bump out’ or even a SECOND story addition. Because basements count toward MNUA, but not FAR, expect a lot of new buildings with basements apartments. The owners could only do a 230 sq. ft. addition. Not a second story. They could however build a new dwelling behind it up to 2200 sq. ft.
4. Start FAR at 1, give .25 bonus for more dwellings. The FAR is .75, lower than any Low Rise zone, and effectively lower than Single Family zoning (only governed by height and lot coverage). If RSL is meant as a transition between multifamily and single family, it is more restrictive that both. 5. Lower the density ratio to 1 to 1500. Fourteen percent of the newly minted RSL lots will not even support a second dwelling. Why go through this process then wipe the development capacity of 900 lots off the table? Rounding up for density at 1.85 * 2000SF means any lot under 3699SF is still a single family lot, but MNUA effectively limits all dwellings to an FAR as low as of .59. 6. Allow more than one Accessory Dwelling Unit (ADU). All these lots are in urban centers, where we are planning to put almost all our growing population. Many lots or owners aren’t going to want to built a full second dwelling. Meanwhile, SFZ will soon allow two ADUs per primary residence. This flexibility will preserve many existing houses, and provide homes for new residents right in the urban villages. 7. Exclude ADUs from MNUA. An accessory dwelling unit counts against the MNUA, meaning many average houses wouldn’t be able to build a cottage without sacrificing square footage in the primary house. 8. Resist the urge to Design Standard. The two Design Standards for RSL are ridiculous. Different color walkways to the house in back? Why? We don’t expect such ham fisted wayfinding in multifamily zones where there’s likely more front doors. One of the great strengths of the proposed code is that it did away with the many of the restrictive types, like ‘tandem housing.’ Let’s not dilute it with well meaning micro management, only to find out that we’ve created a less than graceful solution (remember the platypus!). 9. Allow exceptions from MHA when preserving existing houses. Subdividing existing houses into multiple units will be penalized by the Design Standards, and be subject MHA fee, at the full price for the area of units. The MHA fee calculation is gloss floor area/total units X net increase of units. A 3000 sq ft house, converted into a triplex from single family, would pay MHA on 2000 sq ft as if new, or up to $41,000. That neither incentivizes preservation or the creation of more affordable housing. This is a triplex. Converting it under the MHA regime would cost tens of thousands of dollars in MHA fees in addition to the requirements of retrofitting. 10.Take out limit on number of apartments. The stigma of apartment living results in one of the most efficient (and revered) forms being outlawed. The code is clear: RSL outright outlaws more than three apartments regardless of lot size. No cute Capitol Hill fourplexes. This fourplex is not allowed under the new RSL zone. 11. Eliminate owner occupancy requirements. We don’t require owners to live on site in other multifamily zones, owner occupancy requirements will severely limit the number of accessory dwelling units and they reinforce a fundamentally class based stigma against renters. 12. Change all residential zones to ‘Residential’. We now have three titles for zones where residences are the only use; Single Family, Lowrise, Residential Small Lot. While RSL is being treated as a unique bridge between SFZ and LRZ, it should be part of a continuum of dwelling per square foot. Streamline! 13. Amend Seattle Residential Code to cover up to four apartments. Building codes switch to the more demanding SBC for anything more dense than a duplex and ADUs are considered as such. When buildings should be getting more efficient, like stacking a third apartment on top of a double decker, there is a quantum leap in construction cost, driven by code compliance. 14. Allow Live Work and Corner stores. In midrise zones, having residential suites at the street level seems forced. Two blocks from the center of an urban village, having an office space legible from the street makes total sense. Allowing corner stores would expand the walkshed so more people will walk to pick something up, rather than drive to a supermarket. Neighborhood institutions start with entrepreneurial neighbors. Give them a place. New projects in construction all over! Here is a juicy preview of projects to come! Why aren't we seeing more Backyard Cottages? In a city where the land use policy discussions are centered around density, the lack of new housing units, affordability even rent control and sustainability, why aren't Backyard Cottages more popular and more prevalent? On Thursday, I'll be on a panel discussing the state of Seattle's Backyard Cottages with City Council from 12-1 pm. 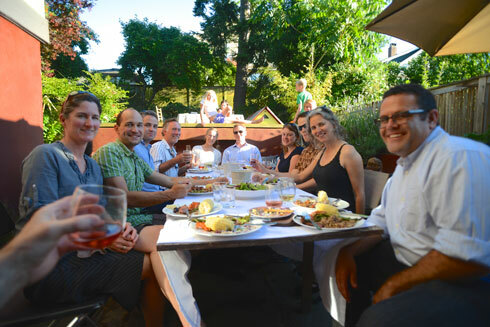 The premise of the 'Lunch and Learn' is one, to assess the status of current planning efforts and two, look at some alternative strategies from Portland. The siren's call of Seattle's summer has brought everyone back to town. Last night, we celebrated our the solstice (a little late), the return of Holly from Sonoma and Forrest from Madrid, and had a little send off for Gunnar who is heading back to Norway's midnight sun. 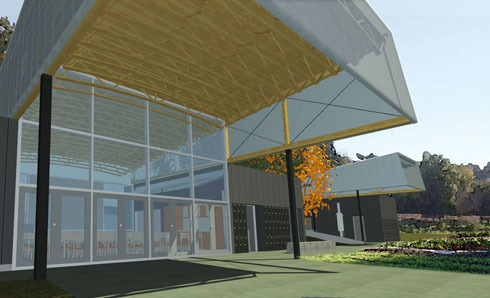 We're starting a two projects in Mazama (schematic design images upcoming). We've been on an intense push the last few weeks to develop a schematic design for the new Classroom Building at the Rainier Beach Urban Farm and Wetlands (RBUFW). We're incredibly excited that Seattle Parks and Seattle Tilth were able to compress a two-phase master plan into a single project, but the result has been a very aggressive schedule for the design phase! For inspiration, we've been looking at pragmatic agricultural structures, both the simple closed forms of storage sheds and more "prismatic" shapes of greenhouses and barns. Greenhouses are particularly intriguing in the way the inside reveals a complicated structure and interior volume that is barely suggested by their taut and simple exterior form. Sited to preserve the maximum agricultural land, the Classroom Building is nestled into a hillside along the east edge of the property. Three closed "boxes" containing support functions are slotted into the hillside, with the open space between accommodating the classroom and a grove of existing trees. Above the boxes, a pair of elevated canopies create the primary function spaces and extend out over the pathway to provide plenty of covered outdoor space. From the outside, these canopies appear as simple translucent volumes, but the inside reveals vaulted space, filtered sunlight and expressive structure. We've taken inspiration from architects such as MW Works and VJAA who accept the construction techniques of industrial space-making, but turn around and use those conventional materials in a very refined and thoughtful manner. Seattle Magazine "On the Urban Farm"
Seattle's Child "Urban Farms Grow Healthy Eaters"
The Seattle Times "An Urban Farm Helps Immigrants from East Africa Settle in Seattle"
The Saratoga residence is moving along-soon we'll have the exterior wrapped up, and the arcade complete! The interior walnut cabinetry and floating stair treads/glass rail should be installed soon! The kitchen, in the foreground, is going to feature a 14' long double loaded island, packed with functionality. Tucked under the stairs, we'll have a nerve center for all the household computing and controls. There is a private, ornamental garden beyond the dining room's window wall. 2012: Recap of a great year! CAST had a great 2012--a mixed use studio, our first prefab houses, a pioneering urban farm, some great residential projects and a fabulous cabin in Mazama are just some of the many projects that we worked on this past year. Canal Street Studio, a mixed use building, is almost dried in and the interior is starting to take shape. Looking good! If you are interested in urban agriculture and would like to share your ideas to shape the Rainier Beach Urban Farm, please join us Saturday, July 28th from 11:00 am to 12:30 pm for an open event to discuss the project! Stay for the community picnic or just get your hands dirty during the drop-in work party every Saturday from 10 am to 3 pm.